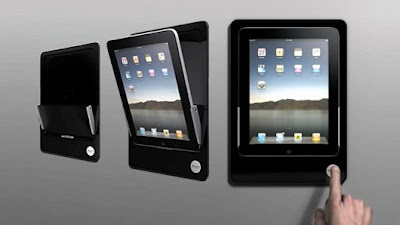 Now available in North America Bracketron, the iRoom iDock is a motorized docking station for your Apple tablet that can be mounted in your wall. When connected to your wall, the proximity sensor opens up and when you are around to take your tablet and if there is a power failure, it will go to Standby mode. Dock is available in landscape or portrait mode and is available in black, aluminum or white - or you can get a custom color to match the walls of your house.